A couple of years ago, I made a dip to take a party, made from Greek yogurt, cilantro and lime. I unfortunately left it at home, so I needed to find some way to re-purpose it. I decided it might make a good marinade, and the "magic" chicken was born. During summer, a simple grilled meat and salad is the perfect dinner. 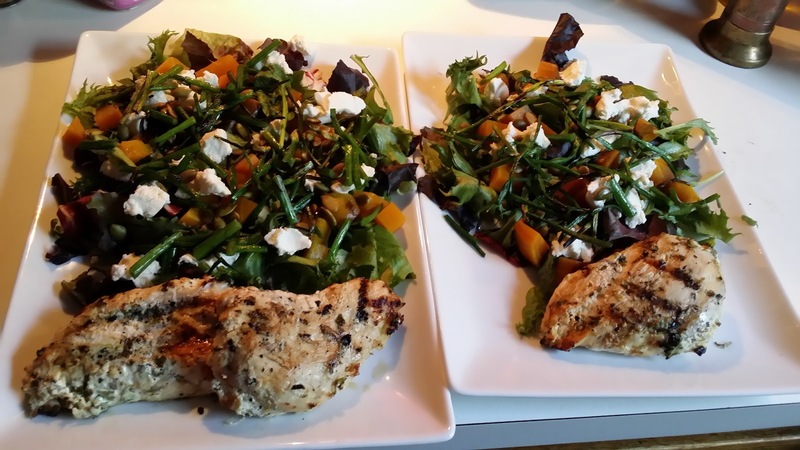 It is simple to throw on some beets when grilling your protein, and then incorporate in your salad. Goat cheese and beets are a pretty classic combination, but I love the golden beets even more than the red, because they are more mild. This dinner was a really great summer salad ! In a large bowl, mix together yogurt, cilantro, zest and lime juice. Salt and pepper chicken breasts generously. Place chicken in the yogurt mixture, and let marinate overnight. When ready to grill, preheat grill to high, and cook chicken 4-5 minutes on each side until completely cooked through. Rub the beets in the the olive oil, and wrap in foil. Place on the grill, and cook while chicken is grilling, turning frequently. Remove from grill, let cool, peel and dice. Toss scapes in olive oil and lightly grill, then chop. Arrange salad ingredients on a platter, top with your favorite dressing ( we like a citrus vinaigrette) and serve with chicken.